Discussion in 'Epson InkJet Printers' started by BirdWife, Apr 11, 2019. I have a Epson SureColor P600 printer that I ONLY use to print gray scale. The all cartridges that are currently in it are the originals that I put in when I received this printer in January 2019 (It is a refurbished printer to replace one which I purchased in June 2018). The three black cartridges (I dont use the glossy black), are going down in amounts that I would expect, however the colour ink is also going down, all at varying amounts. I understand that every time the printer is turned on and it prints a "small amount" of colour ink is used to clear the print heads so that they dont clog. What I do not understand is why some of the colour ink is being consumed at the same rate as my black ink, while other coloured ink is barely being used. 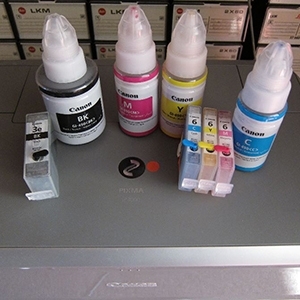 Using Epson's logic, all colour ink should be being consumed at the same rate if it is only being used to clear the printer heads. I rather think that small amounts of colored inks are used even if you print grayscale, this to offset small color shifts of the black and gray inks. The driver is doing such corrections based on the various driver options. The driver is converting the image into grayscale but still uses some of the colored inks together with the gray inks. Just to give you an example - I'm using a P400, and if I load the matte black cartridge with a clear ink/cleaner and print black it is printing cyan , printing the matte black ink without that cyan byprint it would have a brownish black look, and not a neutral look. And I can give you more examples for such embedded color corrections. Black or gray inks still have a color tint which gets corrected by the driver. WilloBee, Julia, BirdWife and 1 other person like this. Can I ask...when (The Hat) you say that 'if I load the matte black cartridge with a clear ink/cleaner and print black' could you explain what that means and why you would do that? Are you using other than Epson Inks? Or have you some other ink delivery system? NB re rates of ink use...orange seems to stay forever while cyan and magenta disappear fast, yellow coming in second along with one of the blacks. But then, I am printing colourful stuff. I think what The Hat is trying to say, in this uncharacteristic minimalist way, is it was Ink Stained Fingers that posted that and who you need to direct your questions towards.